Just recently the New Haven based metal titans DEAD BY WEDNESDAY pre-announced the EMP Label Group U.S. Tour Feat. 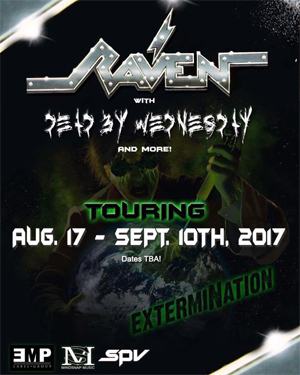 RAVEN and DEAD BY WEDNESDAY for August 17th – Sept. 10th, 2017! Now the band reveals also the dates and venues, check them out below. The tour is presented by Mindsnap Music. DEAD BY WEDNESDAY released their latest effort Darkest Of Angels in May 2016 via EMP LABEL GROUP/eOne, (and in August in Europe via Ellefson Music Productions/SPV), featuring 11 tracks with 11 heavyweight guest vocalists including, Brian Fair (Shadows Fall), Waylon Reavis (A Killer’s Confession, ex-Mushroomhead), AK (Flotsam and Jetsam), John Arch (Fates Warning), Rob Dukes (Fragile Mortals, ex-Exodus), Carley Coma (Candiria), Sean Danielsen (Smile Empty Soul), Paul Stoddard (Diecast), Kris Keyes (formerly Gargauntua Soul), Antony Armageddon (Armageddon) and Ceschi Ramos (Fake Four, Inc.). Earlier this year DEAD BY WEDNESDAY released the lyric video for “I Will Define”, featuring Waylon Reavis of A KILLER’S CONFESSION.